Need a new tetherball set for the summer? In this buyer’s guide, we’ve reviewed 5 of the best tetherball sets on the market right now in terms of value for money. We’ve also outlined some key considerations when buying, allowing you to choose the right set for your family’s needs. Photo by Scott Akerman licensed under CC BY 2.0. In this part we’ll begin our reviews! Read on to find the best portable tetherball sets on the market. Looking for a permanent tetherball pole instead? Click here to jump to the relevant section. Lifetime’s tetherball set is one of the more expensive portable options on the market. So what do you get for the extra cost? Super sturdy, rust-resistant 2″ wide pole. “Softplay” tetherball (comes with a pump and needle). Essentially, you get everything you need to begin playing tetherball in your own backyard as soon as the shipment arrives. But this set is more than just a beginner’s option: it’s built to last. This pole will withstand harsh weather and intense gameplay with ease. Even if you somehow manage to damage the pole (or the base), Lifetime will most likely replace it under their warranty agreement. Although this set is a bit more expensive than most others on the market, we think it’s definitely worth the cost. If you need a super sturdy portable tetherball pole that’ll last for a number of years or more, look no further. Super sturdy, tough pole and cord. Will withstand even the most intense tetherball games. Nice soft ball, comes with a pump and needle. Slightly expensive, but we think it’s worth it. Park & Sun’s tetherball set uses quite a unique design to make their pole portable. Instead of employing a bulky base, they’ve gone for a tripod layout. The pole has three legs, plus a 12″ central ground spike to keep it stable during play. When you want to move, simply take the main pole apart, pull the main spike out of the ground and detach the leg mounts to reposition them. The main benefit of this design, compared to the solution Lifetime has come up with, is there’s no massive base. This means that this tetherball set is easy to transport and store, and you won’t have to empty out a heap of sand or water each time you want to move it. However, the downside to this tripod leg layout is it’s not quite as stable as having an anchor-style base. This pole will wobble a bit. Depending on how soft the ground is, this movement shouldn’t affect play too much. With the Park & Sun tetherball set you also get a nice soft ball, tough nylon cord, a pump and needle, and a handy carrying case for easy transport. There’s no warranty, but this tetherball set is very well priced considering what you get. Super simple to set up and take down – storage case makes transport easy. Regulation size and texture rubber ball, comes with pump and needle. Can wobble a bit during play, not incredibly sturdy. Now we’ll look at the best permanent tetherball poles on the market. This is probably the sturdiest tetherball set on the market right now. If you cement it properly, you’ll have a playground-quality pole that’ll last a few decades or more. Why is it so tough? The pole itself is made of thick, premium-grade galvanized steel. This stuff simply doesn’t rust, and because it’s pretty thick it can withstand even the toughest of hits without wobbling. Even the top eye (where the rope attaches to the pole) is incredibly strong – it’s highly unlikely to break off. The ball is nice and soft but won’t come apart easily, although it might fade after a few years in the sun. The pole is 12′ high once installed (2′ is left at the bottom to be concreted in, so it’s 14′ tall in total). Despite the pole being pretty high, the rope is long enough that most kids aged 5 and above should be able to hit the ball. If you want to make it shorter you can always cut the pole to size. There’s no warranty with this set, so you won’t be losing anything by modifying it. Ultimately, this is probably the best tetherball set on the market in terms of overall performance. The two-piece pole is incredibly strong and feels great to play with if it’s cemented securely. Considering how sturdy it is, we think this pole is definitely worth the cost. The only downside to this set is that it doesn’t come with a pump/needle for the tetherball. If you don’t have a pump already, it’s not that costly to pick up a good one online. Very durable – won’t rust. Comes with a soft ball, suitable for kids. 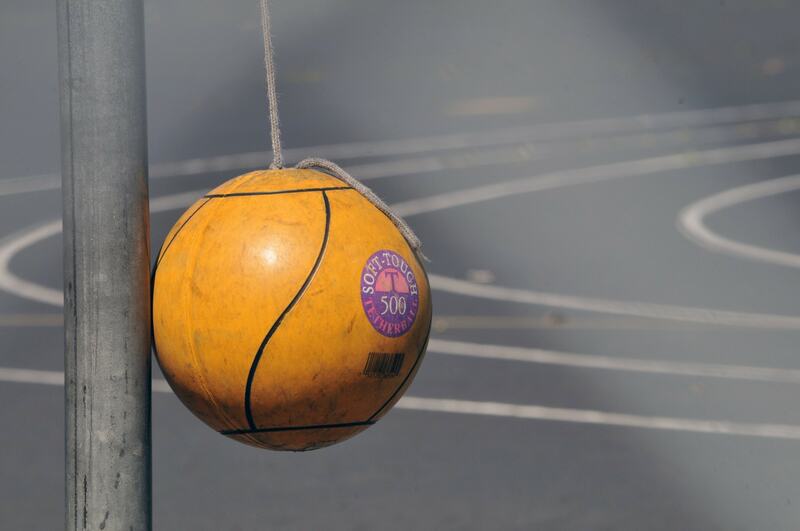 No warranty, and no pump or needle for the tetherball. The Park & Sun Americana is much cheaper than BSN’s similar product. The pole is made of the same galvanized steel material, but it’s a bit thinner at only 1.5″ in diameter. As a result, the pole can wobble at times, depending on how you secure it. However, this tetherball set is surprisingly durable considering the price. The pole won’t rust easily, and the cord is fairly tough. The actual tetherball has a specially designed internal cord connector to prevent the rope ripping out of the ball on particularly hard hits. Plus, you get a pump to inflate your tetherball, and the three-piece pole is relatively simple to put together. The ball comes with an awesome red, white and blue design rather than a generic yellow color. If you’re looking for a tetherball set for kids that has everything you need to get started, take a look at the Americana pole. Just be aware that it can wobble at times – so be sure to cement it securely to minimize its movement. Easy to set up, has everything you need. Quite durable – rust resistant. Can wobble a bit – be sure to secure it well. The final product we’ve looked at is another option that has everything you need to begin playing right away. Baden’s set comes with a pole, a ball, rope, and a pump/needle to inflate your ball. However, the best thing about this product is the price – it’s probably the cheapest tetherball set on the market right now. The pole comes in three pieces rather than two, meaning it’s a little flimsy. Baden has used galvanized steel so it’s pretty rust resistant though. The ground sleeve is made of PVC rather than steel, meaning it can crack during intense games. For some reason, the tetherball itself is quite firm. This can be an issue for small kids. Apart from that, this set is pretty good for the odd backyard game. The rope and ball hold up very well considering the price. If you’re just starting to play tetherball, there’s nothing wrong with going for a basic option that’s easy to set up and take down. However, if you’re looking for something that won’t wobble and will last for a decade or more, we’d recommend the BSN outdoor set over this one. Has everything you need – ball, pole, rope, pump. Will wobble with some hits. Ball is pretty hard – kids might find it painful to play with. Photo by Joe Mabel licensed under CC BY-SA 3.0. In this section we’ll detail some things to consider when buying yourself a shiny new tetherball set. Some tetherball sets have a base you can fill with sand or water, like you can with a portable basketball hoop. You simply empty it when you want to move the tetherball pole or put it in the garage for the winter. Others have a tripod base to prevent the pole from falling over – you can simply pick it up and take it apart to move it. However, most products are designed to be permanent or semi-permanent. These sets come with a ground sleeve, which you must dig a hole for and use concrete to secure in the ground. The pole can then be inserted into the sleeve to keep it upright. When you want to take it down, you can pull the pole out of the ground and leave the ground sleeve in position. If you find a tetherball pole that’s supposed to be permanent that you really want to make portable, there’s a hack you can do. Simply get yourself an old tire – preferably a wide one. Cement your pole into the tire and presto – you’ve made your own tetherball pole base! As long as the cement-filled tire is light enough to move, you’ve now got a portable solution. Imagine using a soccer ball as a tetherball. Your hands would be pretty sore after a while! Fortunately, most tetherballs are made with a “soft touch” foam outer which won’t hurt your fingers or hands. This material is similar to what they use in beach volleyballs but a bit softer, so it’s great for kids and adults alike. Like other sport balls, your tetherball will lose air over time, especially if you leave it in storage for a while. Most tetherball sets come with a pump and the correct needle to inflate your tetherball. However, some of the better quality tetherball sets don’t come with a pump. Regular sports ball pumps (like the one below) and normal-sized needles should work with your tetherball. Look for poles made of galvanized steel. This material has a protective coating of zinc to protect from rusting. It’s also super sturdy, perfect for withstanding those hard hits. In general, the fewer pieces your pole comes in, the sturdier it will be. Look for two-piece rather than three-piece options if you’re looking to avoid the pole wobbling. Only one of the tetherball sets we looked at came with a warranty – the Lifetime portable set. Generally, if you pay $80 or more for a tetherball pole + ball combo you shouldn’t have to worry about the quality. If it breaks due to a defect, you should be able to get a replacement. However, a warranty is nice to have, especially if your tetherball set is going to have to withstand some serious games! Should I Buy A $100+ Tetherball Set? 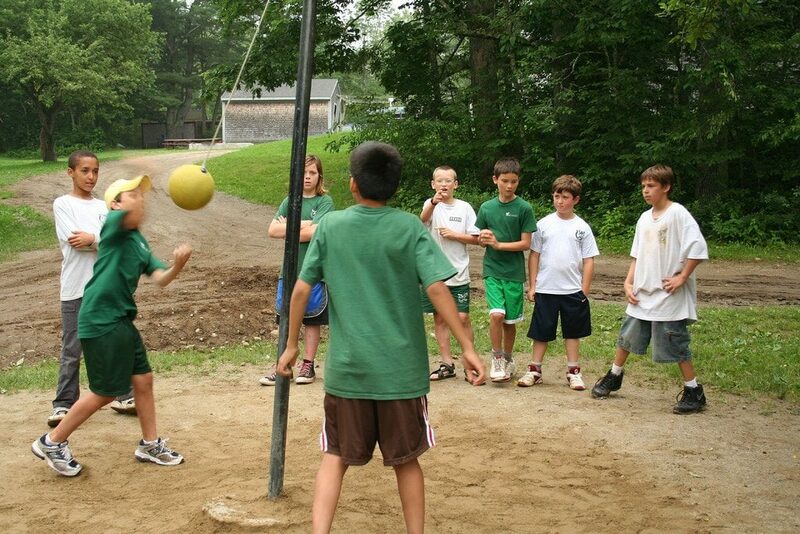 There’s nothing worse than having a flimsy tetherball pole. Unfortunately, a few of the cheaper options on the market are quite poor quality. They might rust easily or move around when you hit the tetherball. If you can afford it, it’s definitely worth getting one of the better tetherball sets on the market. In the long run you’ll probably save money because an expensive pole, like the BSN permanent set, will last you a really long time. 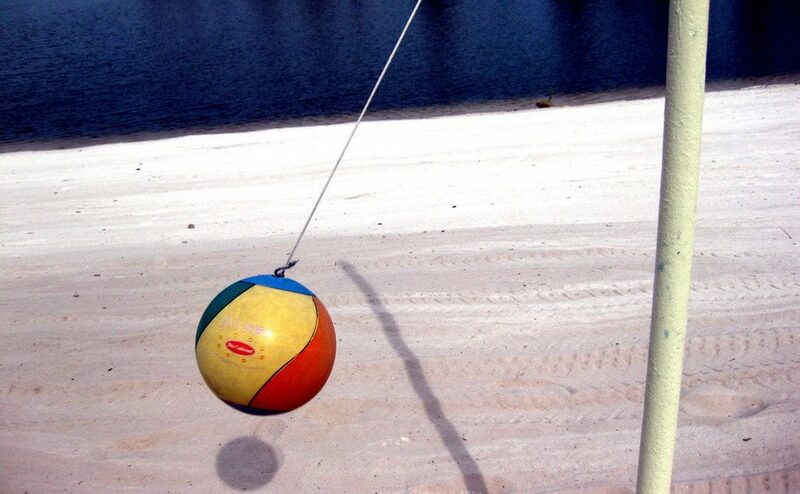 Most tetherball sets are 10′ – 12′ high, so go for a shorter one if you’ve got small kids. With a permanent pole you can cement it further into the ground in most situations, allowing children to reach the ball easily. Remember that if it’s just kids playing, they should be able to reach the ball if the rope is long enough. Problems only arise when bigger children or adults play, as they’re able to knock the ball over the younger kids’ heads where they can’t reach it. If you do shorten the pole, you might need to shorten the rope as well. Take it off at the pole end if possible, trim it, and reattach it securely. If it has a hook at the end you might need to cut it in two places and tie it back together.